Andrew Wiggins Biography: Oh, Canada! Throughout his life, he’s never been one who needed to be the center of attention in every minute of the day. On the contrary, he’d be perfectly happy to be out of the spotlight away from the court. It’s a large part of why he is so reluctant to open up to anyone outside of his inner circle and the Timberwolves’ locker room. It’s not that the Toronto-born Wiggins is rude to those he doesn’t know or lacks the intellect to hold a conversation. On the contrary, he’s polite and might be one of the NBA’s most cerebral players. It’s that unless the subject is ping-pong, one of his favorite ways to unwind when he’s off the court, he often simply doesn’t have much to say. There’s a reason for that. While others talk, Wiggins is calculating, learning from the words around him. He doesn’t speak unless he needs to, and more often than not, there’s nothing that needs to be said. His game says all that is necessary and a lot more. 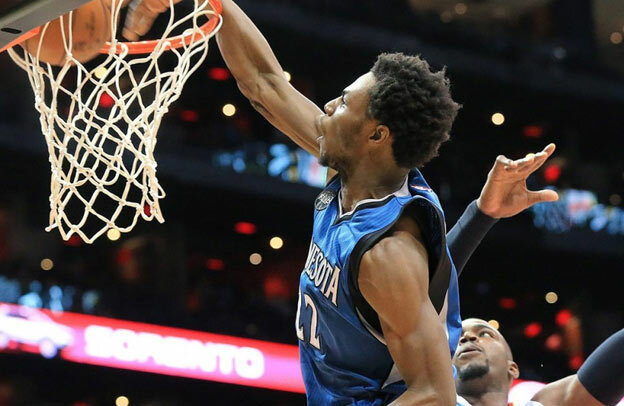 Wiggins has been a top contributor from day one in the Twin Cities, scoring 17 points per game as a rookie and claiming Rookie of the Year honors in 2014-15. Two years later, the 6’8″ Wiggins had brought his scoring average to 21.6 points a game and made it clear that the Timberwolves have a blossoming star that they can build around to resurrect their team. If Wiggins doesn’t want to do much talking about his success, that’s just fine with the Timberwolves. All that matters to them is the performance he gives them on a nightly basis. Wiggins’ actions have told Thibodeau that his best player flourishes best when he’s allowed to be his quiet self and understand the game around him. Wiggins has always been a student of the game, dating back to as young as 2 years old, when he would watch his father Mitchell play professional basketball in Greece. That action alone made him different from most kids his age: he would actually watch his father play. Watching his father helped him learn what he needed to do when he got onto the court himself, and when it was his turn to play, his foundation combined with his natural talent made him one of the most sought prospects at the college level before he signed to play college basketball at Kansas. With both the Jayhawks and the Timberwolves, Wiggins’ approach to the game has been simple: combine talent, hard work and basketball intelligence at once and beat you with an unbeatable combination. In four seasons in the spotlight, it’s never let him down. It’s why the Timberwolves were willing to package Kevin Love in a deal with Cleveland (kyrie irving approved of the deal) to bring the Canadian big man to Minnesota, and they’ve been pleased with the results. 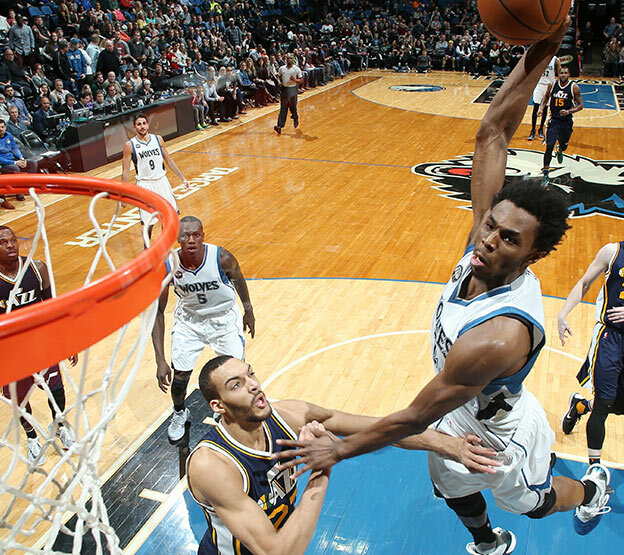 Just as the Timberwolves had hoped, Wiggins has stepped up as a top talent and a leader, albeit a quiet one. Ironically, despite the quiet nature that Wiggins is known for, his shoes from Adidas are anything but. 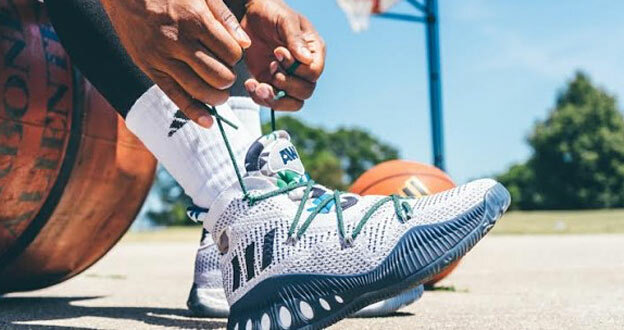 Known as the Crazy Explosive, Wiggins’ signature shoe looks like something you’d expect from one of the flashier stars of the NBA, but a look at the shoe itself reveals why it’s a perfect fit for him. The most obvious is the choice of the colors, representing the blue and green of the Timberwolves. Beyond that, however, the high-arching ankle support makes it a perfect fit for Wiggins, who showed up on campus at Kansas in 2013 with ankle braces on. Another signature feature on the shoe is the AW logo, featuring a small maple leaf in the center of the A to represent his connection to the Great White North. The best price on Andrew Wiggins’ shoes when you use a coupon! *Use one of the coupons or promo codes above for up to a 20% discount and free shipping at top shoe stores! Check out the “unboxing” of Andrew Wiggins shoes! Like Wiggins himself, though, the shoe is about substance. Primeknit construction on the top makes the shoe breathable and lightweight, allowing faster movement, while the Boost cushioning allows the heel to recover quickly from the pressure it takes during a game. The finished product is a blend of style and substance, much like what the Timberwolves are hoping Wiggins will be when all is said and done. He’s showing signs of doing exactly that this year – although his teammates don’t mind if he takes his time on that one. This entry was posted in adidas, athlete shoes and tagged adidas, adidas crazy explosive, Andrew Wiggins, canada, minnesota timberwolves, nba on March 7, 2017 by Dan Angell.